It was obvious at the time that this conclusion was premature to the point of fantasy. 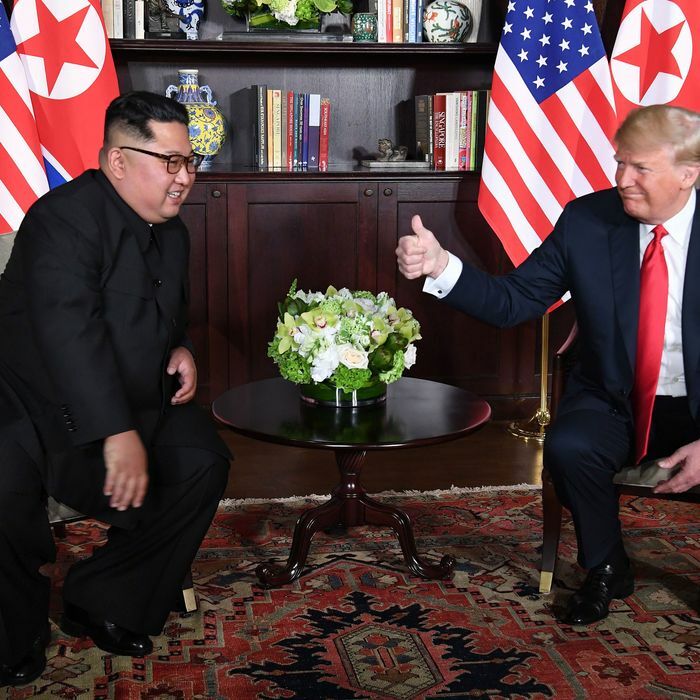 North Korea has made vague promises of denuclearization before, but always leaving most of the benchmarks vague and usually failing to follow through on whatever specific steps it did commit to. It has since become even more abundantly clear that Trump secured absolutely nothing of value. When Secretary of State Mike Pompeo traveled recently to Pyongyang to turn the gauzy assurances of a beautiful, denuclearized future into some specific steps, North Korea blew him off. An official statement called demands for steps forward “gangster-like.” The meeting went “as badly as it could have gone,” a source confessed. At a meeting today to discuss the return of the remains of American soldiers who died in the Korean War, North Korean officials did not even show up. The question all along has not been whether North Korea would take real steps to relinquish its nuclear arsenal, but how Trump would reply when it refused. So far he is pretending his Great Deal is a real thing. The evidence contained in this note consists of Kim repeatedly calling Trump “your excellency” and promising “a new future,” “epochal progress,” and other entirely nonspecific hopes for the future. Of course, Trump pretending North Korea is denuclearizing is better than Trump acknowledging it isn’t and launching a war. But this is the problem with his strategy. By pinning his prestige to high-profile personal negotiations, while surrendering much of the leverage that had been used to contain North Korea, Trump has simultaneously increased his incentive to launch a conflagration while limiting his options short of war. It is entirely possible his ultra-hawkish national security adviser John Bolton was okay with Trump’s dovish lurch because he could anticipate it would collapse in failure and cause a lurch toward war later. On the other hand, it is also possible Trump will continue to insist in the face of all evidence that his deal is working right through the end of his presidency. At this point, that is probably the best-case scenario.